A lesson that covers the eighteenth through early nineteenth centuries will—at minimum —deal with Rococo, the Enlightenment (which encompasses the advancements in the sciences and Neoclassicism), as well as Romanticism. For this lesson, I like to use the death of Louis XIV in 1715 and Romanticism as my bookends. Assuming that students will have just finished learning about French Baroque art and architecture, I like to begin class with an “unknown review.” By this, I mean a work of art that contains many of the features of the French Baroque; but, also provides a way to set the historical stage for the next art period that we will be covering. My favorite work to use is Hyacinthe Rigaud’s portrait of Louis XV in Coronation Robes at the age of five. Students should comment on the formal aspects: the color, the symbols, the drama – all features they have recently learned to associate with the Baroque, especially Rigaud’s other portrait of Louis XIV. The conversation always gets interesting when they begin to surmise the unknown sitter’s identity. After a quick debate over if the sitter is female, or a queen, or a child, give the sitter’s identity. They are looking at the first official portrait of Louis XV (1710–74) at the age of five, a painting made shortly after the death of his great-grandfather, Louis XIV (1638–1715). Comparing the two Rigaud paintings, students should be impressed at the consistency of the clothing: both monarchs are wearing similar white hosery, a blue velvet mantle with gold fleur-de-lis and ermine, and the chain and cross of the order of the Saint-Esprit. The props are also similar: crown, sword, and scepter are visible in both images, as well as the swag of red drapery. These similarities reflect a standard in French royal portraiture that would last a century, making for an eerie consistency that would not carry over into the rest of the art world. Here it is also important to stress that many of the institutions that Louis XIV developed—such as the Académie royale de peinture et de sculpture (hereafter, French Royal Academy)—carried over into the reign of Louis XV. Also, the types of art associated with royal and religious patronage would remain dominant—especially in the case of history painting—which artists would continue to aspire to. Themes to stress throughout the lecture include patronage, education, materials, and modernity. Government control of the French Royal Academy standardizes the education of artists to a point. Knowing an artist’s background and training becomes useful in visual analysis as well as—as one moves closer to modern art—what artists reject about the establishment. Jean-Honoré Fragonard, The Swing, 1766, oil on canvas, 89 x 81cm. A useful source to set the stage about the French Royal Academy is Christopher Allen’s French Painting in the Golden Age (Thames and Hudson, 2003). One of the most accessible surveys highlighting the Rococo is Robert Neuman’s Baroque and Rococo Art and Architecture (Pearson, 2013). Donald Posner’s article, “The Swinging Women of Watteau and Fragonard,” The Art Bulletin, Vol. 64, No. 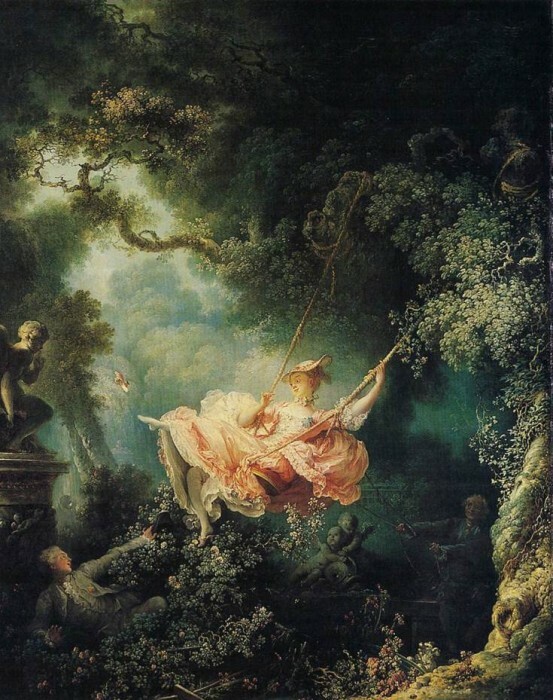 1 (March, 1982), 75–88, unveils the mysteries behind Fragonard’s The Swing. For the Enlightenment, I recommend a series of texts that are more focused upon specific artists. Judy Egerton’s George Stubbs, Painter: catalogue raisonné (London: Yale University Press for the Paul Mellon Centre for Studies in British Art, 2007) and George Stubbs, 1724–1806: Science into Art (Munich: Bayerische Staatsgemäldesammlungen, 2012). For Neoclassicism, Emily Ballew Neff and Kaylin H. Weber’s American Adversaries: West and Copley in a Transatlantic World (The Museum of Fine Arts, Houston, 2013), is a wonderful source with chapters dedicated to addressing West’s grand tour and his art collecting practices, along with a wonderful essay about the masterpiece The Death of General Wolfe. Andrew Stewart’s, “David’s ‘Oath of the Horatii’ and the Tyrannicides,” The Burlington Magazine, Vol. 143, No. 1177 (April, 2001): 212–9 provides a convincing argument for David incorporating visual sources from his Grand Tour into this work of art. For the US Capitol, see James D. and Georgiana W. Kornwolf’s Architecture and Town Planning in Colonial North America (Baltimore: The Johns Hopkins University Press, 2002)—a wonderful text about colonial and early American architecture. Also see: Henry Russell Hitchcock and William Seale’s Temples of Democracy: The State Capitols of the U.S.A. (New York: Harcourt Brace Jovanovich, 1976). For Romantic subjects, see Darcy Grimaldo Grigsby, Extremities: Painting Empire in Post-Revolutionary France (Yale University Press, 2002). One of the best sources on Gericault is Lorenz E. A. Eitner’s Gericault: His Life and Work (Orbis Publishing, 1983). For Barye, see Untamed: the Art of Antoine-Louis Barye (Walters Art Museum, 2006). For information on painting, Anthea Callen’s two publications, The Art of Impressionism: Painting Technique & the Making of Modernity (Yale University Press, 2000), and Techniques of the Impressionists (Chartwell Books, 1982) are invaluable. Each has a tremendous amount of information about the pigments, brushes and binders that academic artists used. Teaching your students to distinguish these characteristics will give them a greater appreciation for modern painters in the later nineteenth century. A large amount of art was produced during this time, so I like to incorporate nearby architectural examples and works of art from local museums. These movements also have a great amount of variation. If you limit yourself to three main geographic areas: France, Great Britain, and the North American English colonies/United States of America, the lecture will be much more manageable. For longer definitions for Rococo, the Enlightenment, and Romanticism I encourage the use of Oxford Art Online. Académie Royale de Peinture et de Sculpture (French Royal Academy): founded in Paris in 1648 by a group of artists including Charles Le Brun. One of the aims of the institution was to move painting and sculpture away from craft-based associations, like the medieval guild system, by emphasizing the intellectual status of painting and sculpture over manually based activities. As part of its activities it organized the Prix de Rome, a competition for young artists that allowed the winner to study at the Académie de France in Rome. To receive membership into the French Royal Academy, artists needed to submit a reception piece. This work would forever tie an artist to a particular genre of art. The hierarchy of genres was codified by the French Royal Academy: history painting occupied the most important position, then portraiture, landscape, and still-life, respectively. Only history painters could hold positions within the French Royal Academy. After the Revolution, in 1795, the French Royal Academy was renamed the École des Beaux Arts. Enlightenment: a term characterizing the cultural prevalence in western Europe and North America of certain shared ideas during the late eighteenth century through the early nineteenth century. Though not a single unified movement, it was founded on the belief in progress and in the power of reason. Recent achievements in science encouraged the belief that, through the acquisition of knowledge and the application of reason social, intellectual and moral reforms could be effected. The impact of the Enlightenment on the arts took various forms. Some artists paid homage to science, others studied the classical past. During this time, Classical art’s realism, restraint, harmony, and order, was in line with Enlightenment thinking. By using both classical style and subject matter in contemporary works, it was believed that the work could morally improve the viewer. Fête galante: [French, ‘courtship party’] a category of painting specially devised by the French Academy in 1717 to describe Watteau’s variations on the theme of the fête champêtre, in which figures in ball dress or masquerade costume are placed amorously in parkland settings. In short, these works depict the elegant outdoor amusements of the elite. The Grand Tour: An educational trip undertaken by the wealthy and artists, the focus being on the art and culture of Italy. This interest manifested itself in examples of Neoclassical art. This trip could take several years to complete. History painting: a form of narrative painting that depicts several figures enacting a scene normally drawn from classical history, mythology, or from the Bible. Middle ground: a metaphor for intercultural relations. It is a space for accommodation and hybridity. Neoclassicism: Seen as a counterpoint to the frivolity and extravagance of the Rococo, it was a predominant artistic style in Europe and North America at the end of the eighteenth century and early part of the nineteenth century. What is distinctive about this particular classical revival was the emphasis on archaeological exactitude. The scientific studying of artifacts filled many publications. Prix de Rome: the term applied to the premier student prize awarded by the successive state-sponsored academies in Paris. This allowed the painter, sculptor or architect to study at the Académie de France in Rome for three to five years. The Golden Age of the Prix de Rome was from the late eighteenth century to the early nineteenth century during the Neoclassical time period. History painting was strongly encouraged during this time. Reception piece: the work of art an artist submitted to the French Royal Academy to gain membership. The work was submitted by the artist under a specific genre: history painting, portraiture, landscape, or still-life. Rococo: a style of art and decoration characterized by lightness, pastel colors, grace, playfulness, and intimacy that emerged in France in the early eighteenth century and spread across Europe until the late eighteenth century. Though primarily an interior design movement, artists in painting and sculpture moved away from the serious subject matter of the Baroque. When the Enlightenment occurred in France, the Rococo it came under fire because it was deemed to have no intellectual underpinning. Romanticism: a dominant western cultural tendency in the western world in the late eighteenth and early nineteenth centuries. Hard to define, the movement involves the placing of emotion and intuition before (or at least on equal footing) with reason, a belief that there are crucial areas of experience neglected by the rational mind, and a belief in the general importance of the individual, the personal and the subjective. Jean-Antoine Watteau’s Return from Cythera (1717–9) belongs to the early Rococo period. Currently, scholars believe that the painting depicts couples leaving Cythera—a mythical island of love—after spending the day there. If one understands the composition as moving right to left, the couple seated closest to the Aphrodite herm (a tapering four-sided shaft surmounted by a bust) seem to still be under Aphrodite’s spell as their heads are close together in conversation. As the couples move further away from the herm that spell becomes lifted. Moving towards the left, the next couple is beginning to rise, and the couple next to them is walking away, with the lady looking longingly over her shoulder at the first, seated couple. Down the hill, the spell of love is completely broken. Figures engage in social conversation, not the intimate type exemplified by the couple closest to the herm. This type of enchanted scene, usually involving love, was common in the early eighteenth century. Cythera, and its effects, were depicted in theatrical productions and described in contemporary literature. Watteau created this large oil on canvas painting (129 x 194cm) to be presented to the Royal Academy as his reception piece, under the categorization of history painting. However, this painting’s importance stems from its ability to defy categorization within the existing hierarchy of genres (1-history painting, 2-portraiture, 3-landscape, 4-still life). Looking closely at the work, students should be able to see why it does not fit within any existing genre type. Simply put, this does not depict a religious or historical event with either an uplifting or moralizing message. Indeed, it refers to a trip to a world of illicit sexuality—though quite demurely represented. Incorporating classical details, such as the Aphrodite herm, makes the painting more than a landscape. Therefore, the genre of history painting was crossed out and was sagely replaced with fête galante, which translates to mean “elite elegant outdoor entertainment.” Unfortunately, by denying Watteau the title of history painter, he could never be allowed to become a professor at the French Royal Academy. There is a great difference between the demure sexuality depicted in Watteau’s work and the innuendo depicted in the late-Rococo painting by Jean-Honoré Fragonard entitled The Swing. Commissioned by a wealthy man for his petite maison (pleasure house) the composition depicts an enclosed garden (as evidenced by a wall and gardening tools lying in the foreground) occupied by three figures: an older male figure pushing a swing, a lovely young lady who is swinging, and a young gentleman hidden in the bushes. The sculptures, the little white barking dog at the older man’s feet, and other details hint to the relationships between these three figures. The dog, a traditional symbol of fidelity, is located closest to the older man who is probably in a formal relationship with the young lady. The barking dog (who seems angry) is looking at the lady, which leads the viewer to surmise that the dog (and not the older man) is aware of the lady’s infidelity. From there it becomes obvious that the object of the lady’s affection is the younger man hiding in the brush. The sculpture above the young man cautions for quiet, and the two putti figures below the lady glance at her and glare at the dog. The young man is perfectly positioned to catch a glimpse of the lady’s legs as she is swinging. Donald Posner’s article unravels the sexual connotations behind the painting’s the lady’s lost shoe and the young man’s doffed hat. Your students may be somewhat familiar with this work due to a variation appearing in the Disney animated movie Frozen. Using Youtube.com I like to play the song “For the First Time in Forever,” and pause it when Anna jumps up in front of The Swing. The differences between the version in the movie and the painting are significant. In the movie, the younger man is removed, and there are no auxiliary statues. Though the shoe comes off, viewers are treated to a toned-down version of Fragonard’s painting, which now becomes mere innocent flirtation. The Rococo was an era of aristocratic patronage. Towards the later-eighteenth century it gave way to its counterpoint, the Enlightenment. The Enlightenment, which was united by beliefs in progress and the power of reason, was concerned more with understanding and rationalizing our world through study. For the natural world it meant systematizing nature and the creation of menageries, for others it meant the careful observation and documentation of the Classical and Renaissance pasts. The creation of publications that document these findings expedited this spread of knowledge (a prime example being James Stuart and Nicholas Revett’s Antiquities of Athens, published 1762–1816 in London), at least amongst those who had money and could read. The Enlightenment took on different forms in different countries based on an artist’s/patron’s education and interests. Produced in the same year as The Swing, George Stubbs’ The Anatomy of the Horse is one of the best documents showcasing the union of the arts and sciences during the Enlightenment. Stubbs is considered a self-taught artist, receiving only some training from a provincial portraitist. During his formative years, he spent a significant amount of time studying in hospitals and teaching human anatomy. He obligatorily undertook a trip to Italy between 1754–6, as was expected of established artists and young gentlemen during this time, but this figures less prominently in his work. Upon returning to England, he settled in Lincolnshire and commenced the project that would define his career the precise study of equine anatomy. Horse anatomy was an undeveloped field with no real pictorial advancements since Carlo Ruini’s 1598 publication Dell’anatomia et dell’infermità del cavallo. After eighteen months of dissecting horses, intensely studying the skeleton and various musculature layers, Stubbs obtained the knowledge to depict horses with an exactitude that had never before been achieved. In London, this ability attracted patronage from the Whig aristocracy (who brought about the ascension of the House of Hanover) who held similar interests in the natural sciences. Stubbs published the results of his dissections in the 1766 text The Anatomy of the Horse. Executed without backgrounds, Stubbs’ meticulous engravings place the viewer’s attention solely on the horse’s muscles and skeleton from the front, back, and side views, which seem to hover in mid-air. In five steps, Stubbs takes viewers through the layers of muscles to the skeleton. This publication was intended first and foremost for artists, and then for the horse owning and breeding communities. Historically, England founded their own Royal Academy in 1768, in the image of that of France’s, which placed the animal painter at the bottom of the genre hierarchy. Though Stubbs would fight the stigma of being a horse-painter his whole life, without argument, he was the best sporting artist of the eighteenth century. Jacques-Louis David’s Oath of the Horatii (1784–5) also belongs to the Enlightenment, reflecting the period’s strong interest in Neoclassicism. Appreciation for the ancients was instilled in David from a young age, his bourgeois background permitted him to have a classical education. He trained in the studio of Joseph-Marie Vien, an acknowledged admirer of the ancient world. In 1774, David won the Prix de Rome, which funded five years of study in Italy. While there, David absorbed the visual culture around him, which affected the level of archaeological exactitude in future commissions such as Oath of the Horatii. In Oath of the Horatii, David grafted the genre of history painting with Neoclassical sensibilities. Andrew Stewart’s 2001 article presents convincing evidence that the Horatii’s brothers’ poses may have been inspired by antique sculptures that David would have seen in Rome in the Farnese collection. The subject matter of the painting took inspiration from an episode of ancient Roman history that had recently become the subject of contemporary theater. In the center is Horace, who is the father to the three young men on the left and the patriarch of the Horatii family. The young men are swearing their allegiance to protect Rome to the death from an enemy family, the Curiatii. To the right are the Horatii women and children. Among them are Horace’s daughter, Camilla—who is engaged to a member of the Curiatii family, and daughter-in-law, Sabina—who comes from the Curiatti family. Much has been said about the contrast between the male and female figures. However, the moralizing message—valuing your duty to your country above all other obligations including love and family—pronounces the work as history painting. Given that this work was due to the royal patronage of Louis XVI, upon the revolution in France in 1789, this painting served as a rallying point for republicans. A significant reason I prefer Oath of the Horatii over the other great Neoclassical survey staples, such as Angelica Kauffmann’s Cornelia Pointing to her Children as her Treasures (1785), is because of the pigments David used. The darker color palette with its bituminous brown/blacks became a stigma undeniably associated with French Academic art in the middle of the nineteenth century. It allows for student’s to train their eye to recognize an academic work of art, as well as making for a greater contrast against the high-key pigments that the Impressionists would come to use. North American colonial-born painter Benjamin West came of age during the Enlightenment and appropriately toured Italy, absorbing its artistic environment between 1760 and 1763. West settled in England, coming into royal employ in 1768. His masterpiece, the Death of General Wolfe illustrates a completely different approach to history painting in that it combines modern subjects, settings, and clothing with the traditional uplifting messages of patriotism and sacrifice. As the title suggests, this painting depicts the death of General Wolfe during the French and Indian War’s crucial Battle of Quebec in 1759. Wolfe’s leadership accounted for the British victory and his death catapulted him to the rank of national martyr. Admittedly West took artistic liberties within his painting. In the foreground, thirteen people surround the dying Wolfe, six of them can be identified. In actuality, Wolfe died surrounded by only three. In the middle ground, we see a fairly accurate cliff-notes version the day’s military events chronologically laid out from right to left. At the far right the British have dropped anchor in the St. Lawrence river. The troops are in the process of climbing and dragging the cannons up over the river’s cliffs. In the middle scene the troops are in the process of lining-up and at the far left a soldier runs towards the group in the foreground with news that the British have won the battle. Displayed at England’s Royal Academy in 1771, the five by seven foot painting caused a sensation. Unlike the static, enduring quality of David’s work, West created a dynamic composition that blended factual details (gleaned from objects in West’s art collection, which contained everything from examples of American Indian artifacts to copies of Master paintings), bright colors, gestures, eye contact and expressions, and diagonals. For all of the innovation, some Neoclassical habits remain. It has been remarked that the American Indian’s pose is based on the Belvedere Torso, that Wolfe’s upward glance is perhaps inspired by a Guido Reni painting, and that the full-length standing officer who holds a bandage to his chest is a derivative of the Doryphoros. The Death of General Wolfe also allows for a discussion about the, “middle ground,” or the fusion of cultures/hybridity. The ranger figure in green is a prime example of the middle ground. This ranger wears a combination of American Indian and European clothing and accoutrements, which reinforces his position as a liaison between the British and the Iroquois Confederacy (Mohawks, Oneidas, Tuscaroras, Onandagas, Cayugas, and Senecas). This desire to graft the nobility of the history genre of art with contemporary events was also used by the French. The work of sculpture that probably best straddles the line between Neoclassicism and modernity is Jean-Antoine Houdon’s statue of George Washington. In 1784, the Virginia State Legislature voted to have a marble statue of George Washington created to commemorate his wartime service in the Revolutionary War. By necessity, due to the lack of a strong indigenous academic artistic tradition, the Virginia government had to turn to European artists to complete the commission. Ambassadors Thomas Jefferson and Benjamin Franklin, stationed in France, recommended Houdon. In his childhood, Houdon was surrounded by artists and began sculpting early in life, at the age of nine. He studied in Michel Ange Slodtz’s (a runner up for the 1724 and 1726 Prix de Rome) studio, and won the Prix de Rome himself in 1761. In Rome, he was enthralled with ancient works, but it was the works of Michelangelo that captivated him. It became a lifelong ambition of his to create a monumental equestrian statue. Houdon traveled to America to Mount Vernon to take Washington’s measurements and to make a mold of his face. He also hoped to convince the U.S. federal government to commission an equestrian sculpture from him when funds permitted. Back in France, Houdon faced a clothing conundrum—depict Washington in modern dress à la West or in antique robes as tradition dictated. In the end, it was decided to depict Washington in modern dress. Though Washington stands in his uniform that he wore as commander-in-chief of the army, Houdon added many classical elements, the most noteworthy of which are the fasces (a symbol of authority, there are 13 rods—which represent the 13 colonies), and the plow (which references the story of fifth-century BCE Roman soldier, Cincinnatus who gave up the offering of absolute power to return to his farm). In 1796, Jean Antoine Houdon’s (1741–1828) sculpture of George Washington was installed in the Virginia State Capitol, where it stands to this day. The United States Capitol was a revolutionary Neoclassical achievement. This federal building in Washington D.C. was envisioned as a seventeen-room brick building that would house the legislative branch of government. As time progressed, other functions were added to the Capitol, such as Washington’s tomb, and a space for the Supreme Court. First submissions showed that American gentlemen architects/builders failed to create adequate elegant and monumental forms that would define the nation’s new building type. Even then President Washington called them ‘dull.’ Ultimately, the chosen design was a synthesis of competition submissions, which had referenced many of the symbols and distribution of spaces used in other state houses, namely: a portico, a dome, a central public space, and the two houses opposite one another. Despite having many different creators (William Thornton, B. H. Latrobe, Charles Bulfinch and Thomas U. Walter—who were a mixture of professional and gentlemen architects), the Capitol’s various parts are united in the Neoclassical style, with the focal point being Walter’s dome (1856–63), which was modeled after the Pantheon. Construction of the Capitol pushed American builders out of their material comfort zones. Originally proposed as a brick structure, it was decided that ashlar masonry should be used for the exterior. For the vaulting, Thomas Jefferson wanted to use wood, Latrobe pushed for masonry. Decades later, builders were pushed to their technological limits using a new material—iron—to create the Capitol’s famous dome. Romanticism, which lasted from the late eighteenth to the early nineteenth century, was an imprecise movement whose main beliefs were antithetical to that of the Enlightenment, particularly the charge of reason. Romanticism is known for emphasizing emotion and intuition over or—Oxford Art Online says, at least equal footing as—reason. It began as a literary movement that then moved to include the visual arts. Géricault’s Raft of the Medusa (1818–9) belongs to the period of Romanticism. Géricault received little formal training, preferring to copy paintings in the Louvre. This massive painting was shown at the 1819 Salon, under the title A Scene of Shipwreck. Though the name “Medusa” did not appear in the title, the public would have had no trouble making the connection between Géricault’s work and the recent disaster. To summarize: The Medusa was an ill-fated ship that left France in 1816, for Cape Verde, Africa. The ship ran aground and sank. Lifeboats could only save a portion of the crew. The approximately 150 people left behind constructed a raft left to cast adrift. For thirteen days, horrors ensued—fighting, starvation, dehydration, and cannibalism. When the raft was finally discovered only fifteen people remained alive. Survivors’ statements were quickly published, searing themselves upon the minds of the French people. Returning to Géricault’s painting, the horrors endured by the survivors are implied, not shown. Though Géricault conformed to the academic standard of idealizing the human figures, unlike a traditional history painting the emphasis is not an uplifting moral or heroic message, ideas traditionally associated with this genre. Instead, the painting focuses on the elemental struggle of humanity against nature. Géricault’s formal choices, especially color, gave precedence to the dramatic emotional, Romantic effect of the painting. Antoine-Louis Barye’s bronze sculpture Tiger Devouring a Gavial (1831) also belongs to the period of Romanticism. Barye (1796–1875) was trained at the Ecôle des Beaux Arts from 1818 to 1824. The study of anatomy, particularly animal anatomy, which he learned at the Jardin des Plantes and at the Museum of Natural History, was of special interest for him. However, Barye did not use anatomical study as an end in itself and incorporated it into emotional narratives. Shown at the French Salon of 1831, Tiger Devouring a Gavial caused a sensation, with many struck by the violence of the scene and won him a silver medal. Here, anatomical exactitude is subservient to the depiction of violence, emotion, and instinct and is used merely as a way to heighten the naturalism of the scene. Keeping in mind that the early nineteenth century was a time when animal instinctual behaviors were being used to help explain human instinct, Barye’s predator/prey sculptures had a profound, perhaps soul-searching, impact upon viewers. 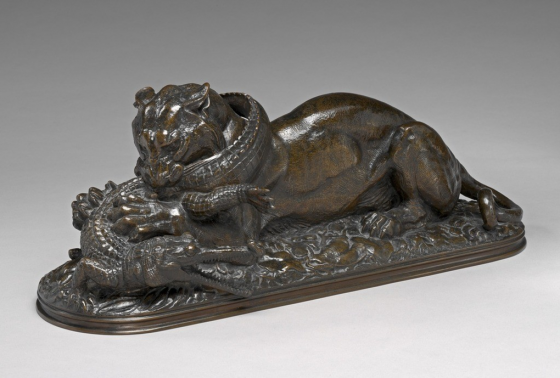 Antoine-Louis Barye, Tiger Devouring a Gavial, 1831, bronze, approx. 20 x 50 x 20 cm. I like to have the class tell me what information struck them the most. It is a fun way to accomplish a review, by ending the period with the attention on what they found most intriguing. This is also a great way to gauge what they will find interesting in future classes. Across Rococo, the Enlightenment, and Romanticism in the west, the ideologies of the French Royal Academy served as a backdrop. Artists fused the visual language taught at the Academy with indicators of the spirit of the age. It is always my hope that by stressing the almost ubiquitous presence of the Academy, and how it affected an artist’s education, patronage, and subject matter, it will underscore the novelty and experimentation of the Modern Art period. Colleen Yarger (author) is an adjunct faculty member at Randolph-Macon College and the Virginia Museum of Fine Arts.